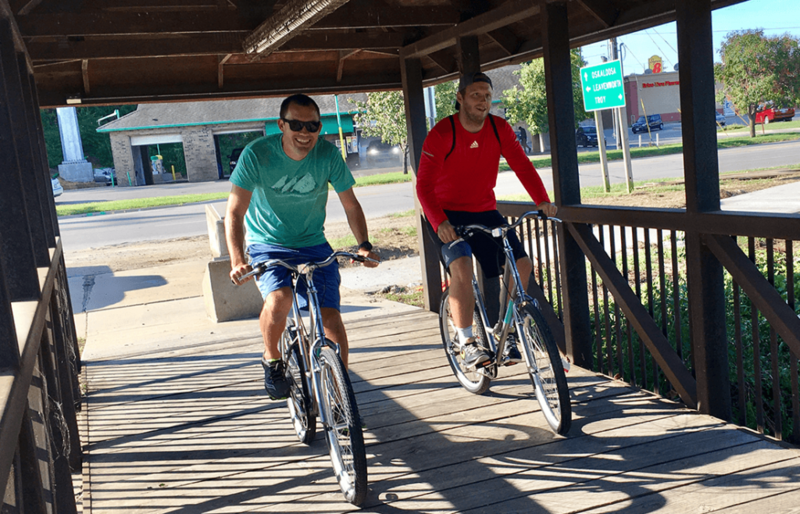 With the Pathways to a Healthy Kansas grant, Live Well Live Atchison was able to purchase 10 user-friendly bicycles that can be “rented,” free of charge. Once you have completed the application form and provided a valid form of identification, you are allowed to use the bike. The bike can then be returned at either of our Partner Operator locations, regardless of where you began your journey. The program was introduced to encourage our community, and visitors, to not only get active, but also to explore Atchison in a new way. What is a bike share? A Bike Share works just like a library. You are free to “check out” a bike each day. The best thing about this Bike Share is that it is free and for all residents, visitors, and friends of Atchison County, Kansas. Bring your ID and fill out necessary Liability Waiver and Rental Application at one of two Bike Share Locations: The Santa Fe Depot or YMCA. Pick out the desired bike and document the bike number back in the office. Your name, number, and rental application will be filed in the office. Locks are also available for rental at no charge. Return your bike back to the office by the end of the day. All bikes are available for rental one business day at a time. If a bike is not returned in time, you will be contacted via cell phone and the missing bike will be reported to Andrea Clements, Executive Director of Live Well Live Atchison. Helmets are not provided and are the responsibility of the rider. Users must also obey the rules of the road, including signaling turns, stopping at stop signs, and riding with the flow of traffic. Please join us in making Atchison County one of the healthiest counties in Kansas.